Verifying the working and performance of the RabbitMQ integration in Enterprise Server can be done by using the RabbitMQ Events Monitor of Enterprise Server. The Events Monitor is run from a Web browser and subscribes to all queues that the user has access to. It listens for events coming in to those queues and displays every event on the page. Figure: The Enterprise Events Monitor for RabbitMQ. Note: For the purpose of this article it is assumed here that a RabbitMQ integration is in place and fully working. You are automatically logged in to Enterprise Server and the RabbitMQ integration. Note: When running the Events Monitor over HTTPS / SSL, see Running the Events Monitor over HTTPS / SSL for the first time. The Events Monitor will subscribe to the queues of all Brands and Overrule Issue that you have access to and will start listening for messages in all these queues. Step 3. Verify that the Events Monitor runs correctly, for example by logging in to Enterprise using Content Station and logging out again. These events should appear in the system.events queue. Step 4. Perform an action within a Brand or Overruled Issue, such as creating a Dossier. Events should appear for the relevant queue. No text is shown after "Connected through:"
When no data is shown below the "Events" header (information about your message queue, the number of events and a table with all received events — see above screenshot). In some cases the Events Monitor will alert you with an error message while in other cases it might not. Note: When no alert is shown on screen, verify the console for an error message. Incorrect user name and password used. Incorrectly configured connection, resulting in Enterprise not being able to make calls to RabbitMQ over/using/via REST. Logged in but no queues are showing The Events Monitor only shows queues that the user has access to. Ensure that your user is part of a group that is authorized to the Brand or Overrule Issue you are working in. The user you are monitoring with does not have access to the Brand or Overrule Issue that you are generating events for. The Events Monitor connects with Enterprise Server and subsequently with RabbitMQ. Both connections can be over HTTPS / SSL. 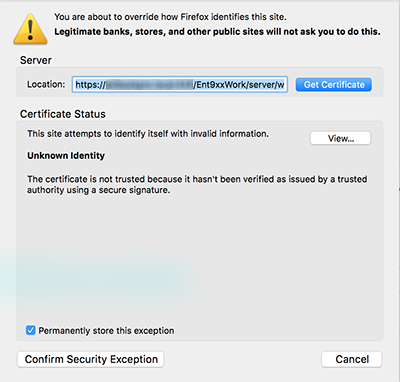 When using a self-signed certificate that is not trusted by the Web browser, messages are shown that allow you to trust the connection for Enterprise Server, while a more manual process needs to be followed to have the Web browser trust the connection for RabbitMQ. Note: The following steps show the process for Firefox but can be used for all Web browsers. Step 1. Run the Events Monitor. A warning is shown that the connection is not secure. Step 2. Click Advanced to expand the window. Step 3. click Add Exception... .
A window appears asking you to confirm the connection. Step 4. Click Confirm Security Exception. The connection with Enterprise Server is now trusted and the Events Monitor continues loading. When trying to connect to RabbitMQ, the connection fails and a 'Lost connection' error is shown. Step 5. Copy the URL from the window and click OK. Step 6. Paste the URL in the address bar of your Web browser, replace the 'wss' prefix by 'https' and press Enter. Step 7. The same messages appear as for trusting the Enterprise Server connection in steps 1 to 4 above. Follow these up to clicking Confirm Security Exception. The page continues loading but remains empty, which is OK. Step 8. Enter the URL of the Events Monitor in the address bar again and press Enter. The Events Monitor now loads properly.